Can Macron Succeed Where Obama Failed? For the first time in years, France is being looked at with interest and admiration. The country is having its ‘Obama moment’: the feeling that no ambition is too high for a great nation, especially when it comes to carrying the torch of liberal democracy and optimism. In fact, the parallels between Obama’s 2008 and Macron’s 2017 victories are staggering. In both cases, a charming new face of exceptional talent and self-confidence emerges against all odds to offer a radical departure from the past. Politically, Macron, like Obama, comes from the centre-left but proposes to work with moderates from both sides and to break away from ideological posturing. Economically, the new French President puts forward the vision of social mobility, innovation economics, and egalitarian liberalism once championed by Obama. Culturally, it is hard not to notice the commonality between Obama’s multicultural patriotism and Macron’s proud promotion of an evolving French identity. The obvious problem for Macron is that the Obama era ended up badly, if not awfully, with Trump’s victory. Despite all the great achievements Obama presided over, the US is a deeply divided country today. In fairness, he did not initially run for office knowing the worse financial crisis since 1929 would sweep away millions of jobs, accelerate the technological transition and leave many lives shattered. Obama’s recovery plan proved successful on paper, but this does not take into account the social and geographical disparities that ended up further entrenched. Obamacare may have changed many lives for the better, but it has not been popular and is now on the verge of collapse. Obama’s narrative of a reconciled nation did not take off – racial violence and the polarisation of the Trump vote indicate exactly the contrary. In short, Obama did not find the recipe for inclusiveness and reconciliation. Crucially, he did not install a cultural hegemony for the political centre. These considerations should logically lead one to pour cold water on Macron’s victory. The centrist leader has set the bar very high with his ambition to move the French political axis, i.e. the open vs. closed divide, or one that pits progressives from both right and left vs. conservatives from both sides. The tactical nomination of a centre-right prime minister in a government that includes centre-left heavyweights sets the scene for the June legislative elections. It is hoped that En Marche, Macron’s new party, will win an absolute majority. If not, a majority will be formed with the support of moderates in the Republican (centre-right) and Socialist (centre-left) groups. The obvious risk of this experiment is that failure would place the Front National, or a more radical right, in an ideal position for 2022. Macron could herald a backlash à la Trump, be it with Marine Le Pen or another personality. 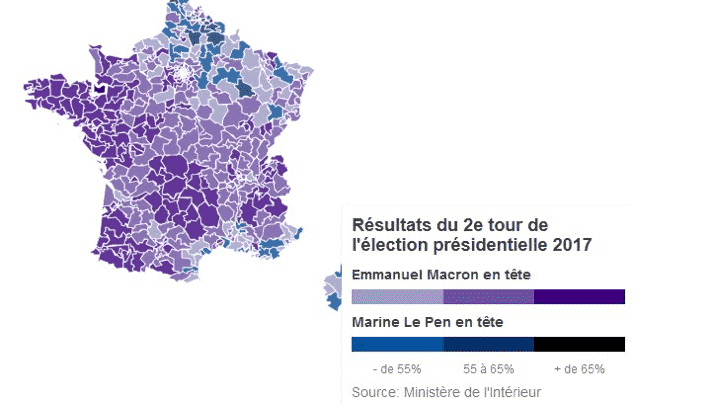 Indeed, the presidential election’s data shows how divided France already is, both socially and geographically, and much more so than in 2012, when François Hollande was elected. 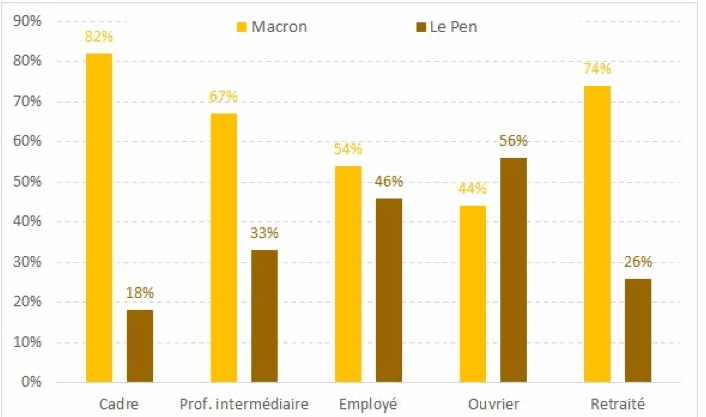 Macron owes his election to 43% of registered voters only, of which roughly the same proportion (43% according to IPSOS) voted above all against Marine Le Pen. Bearing in mind that this election was François Fillon’s to win, had the conservative candidate not been placed under investigation, Macron’s mandate is anything but solid. The new French president is well aware of this and, therefore, has moved from an initially outspokenly liberal platform, both economically and culturally, to a more balanced one. His agenda rests on an implicit deal between more protection at EU level and more flexibility at home – ironically, the exact opposite of what Theresa May wants to do in Britain. The first pillar includes a more growth-friendly Eurozone, greater attention to social and environmental impacts in trade deals, the reform of the posted workers’ regime, greater control of illegal immigration in the Schengen area, and reinforcing European defence capabilities. Macron has talked numerous times about a “Europe that protects”. His recent press conference with Angela Merkel was an occasion to stress this message, far from the accusations of pro-EU idealism he has been facing. In parallel, Macron wants more competition, greater public spending efficiency and lower taxes on business in France. This is not the neo-liberal agenda caricatured by some, but his plans for labour market and pension reforms, if pushed through, would take France closer to Germany or Scandinavian countries. They will certainly trigger significant street protests and weaken his parliamentary majority. Macron’s gamble is that, with a little help from Europe, this agenda will quickly deliver a confidence boost, faster growth, job creation. Assuming this works to some extent, will this be enough to reconcile FN voters with the world as it is today? We have learned from Obama that abstract growth figures and institutional reforms can do little if they do not benefit and reassure in very concrete ways large swaths of the lower middle class electorate. Economically, Macron will need to pay special attention to the quality of growth and jobs; to the winners and losers of his reforms; to the further blasts that technology and automation are going to administrate to thousands of workers trapped in routine jobs. Crucially, the new French president also needs an agenda that tackles the cultural dimensions of the populist vote, call it ‘cultural insecurity’ or ‘fear of cultural displacement’. During the victory celebration and transfer of power ceremonies, everyone has seen Macron’s ability to embody national symbols and to set his own steps in the long walk of French history, something which is dear to French people’s hearts. These are important markers, but France has been suffering for too long from a gap between rhetoric and reality. Concrete actions to boost social trust and build bridges between communities living in silos are badly needed, be it renewed forms of civic participation or incentives for social engagement. Macron’s challenge to protect a reasonably open, tolerant model of society, and to promote a Europe that means more than just the sum of its nations’ interests, is a battle shared by many across the political spectrum and across borders. For all these reasons, the new French president deserves widespread support. Next Next post: Élections britanniques : Theresa May prise à son propre piège ? Renaud Thillaye Blog at WordPress.com.